If the computer on which you have installed PlayIt Live is not connected to the internet is it possible to activate offline. From the Activate Offline window you can enter your Client ID and Licence Key. These are generated from the Licences page in the My Account area of the PlayIt Software website. A new licence can be generated by visiting: http://www.playitsoftware.com/Account/Licences/Generate. You may be prompted to log in or create an account. 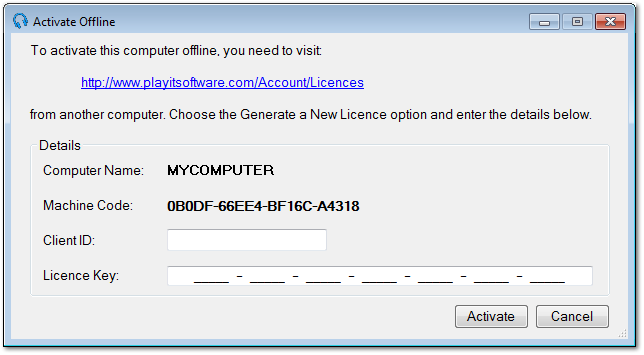 From the Generate New Licence section, enter the Computer Name and Machine Code you see on PlayIt Live and click Generate Licence Key. Once generated you will be presented with a licence. Make a note of the Client ID and Licence Key and copy this to the PlayIt Live window. Licences are normally valid for one year.